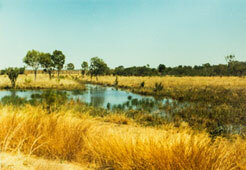 In 1985, eleven properties in the Barkly Tableland and two in the Victoria River District were drought declared. Cabinet was advised that anticipated drought assistance for 1985/86 was initially $150,000 but this had now been revised up to $650,000 to $800,000. In terms of the Alice Springs pastoral district, the Northern Territory drought assistance scheme provided that properties became eligible for assistance only when they entered their second consecutive year of declared drought. The submission advised that should the drought enter a second year in this area, the total cost of the consequent assistance would be in the order of $1 million. The recommended option was for Cabinet to note that $650,000 in additional appropriation would be required to meet the cost of assistance to drought affected properties in 1985/86. The alternative was to revoke the existing drought assistance policy and provide a lower rate of assistance, an option which was not recommended. Cabinet noted the advice in the submission. Read the Cabinet decision - submission number 3754 and decision number 4393 of 26 November 1985 (2.5 mb).